Last time I asked the question: But is any of this significant? I think it is. The two forms of wire weaving are distinctly different in form. The Nahlbinding form uses a distinctive looping pattern, known in fiber circles as the Coptic stitch. In addition, the Nahlbinding form, like Nahlbinding that is done with yarn, uses relatively short pieces of wire, usually 12 to 18 inches long, that are joined together to form a woven chain or some other form. The knit form uses the same pattern as the knit stitch in Knitting. The knit form also uses a continuous piece of wire. The length of this wire is limited only by the ability of the maker to create it. So now we have a problem. The original form of Trichinopoly, is the knit form. But historically it has not been sorted correctly from the Nahlbinding form. The teacher in my Gulf War class chose to call the Nahlbinding form “Baltic Wire Weaving”. The problem with that is that it certainly did not originate there. Several years ago I found a piece of it in the touring exhibit of the female pharaoh, Hapshetsut, which puts the date back to 1508–1458 BC, and Egypt is no where near the Baltic. I don’t really have a solution for the naming problem, but I do have another VERY important point to make. When I began in the SCA many years ago I was told that knitting was not done pre-1600. Then latter I was told it was brought to Spain by the Arabs and was used there by about 1200. Then I ran across the fact that during the reign of Henry VIII a law was enacted requiring all men to wear a knit cap on Sunday, and another stating that women must wear white knit caps unless their husband was of considerable social standing, and only the nobility could wear knit goods that were produced outside of the realm. And then about four or five years ago the Museum of London digitized, and made available, an extensive collection of knit coifs, flat caps and other items that are pre-1600. But what does that have to do with Trichinopoly. Simple. The original identified form of this wire weaving, the Trewhiddle Hoard, is believed to have deposited about 868 AD in the Cornwall area of England. And there appear to be other pieces in Scotland and Ireland. That puts the structure of knitting in the British Isles before 868 AD, considerably older that the 1500’s. Now we have the opportunity for more research. In Scandinavia we find Nahlbinding used for both fiber and wire. In Egypt we see both knitting and Nahlbinding techniques used in fiber. The Victoria and Albert has a Nahlbinding pair of socks, and I have personally seen the same technique used in jewelry. Can we locate the knit structure in Egypt in wire jewelry? And in the British Isles we find the knit structure at least as early as 868 AD in metal. Can we push it back farther in metal? And can we find it in fiber? Fiber is much more easily destroyed by time and the environment than most metal, but bogs can preserve animal fibers, like wool. The time has come to actively revisit old finds, in both metal and fiber, with a thorough understanding of knit and Nahlbinding structures. The time has come to make sure that researchers are well versed in the nuances of wire weaving structures. So last time we were discussing a particular set of authors, who were describing the structure of a Wire Woven Silver Scourge. They also listed several other artifacts. I raised the questions: Were they consistent in the use of the word Trichinopoly? And is ANY of this significant anyway? As many college advisers in graduate school will tell you, it is important to find the original sources for the referenced chains. Not the articles that reference the discovery, but the actual reports with line drawings and pictures. Or, better yet, current high quality pictures of the artifacts themselves. The farther that you are from the original source of information the more likely that mistakes have entered into the record. In the ensuing 140 years since the finds, England has been involved in two major World Wars including the second World War which is known to have destroyed many items. It is possible that some of these pieces may have vanished or been destroyed. The first artifact that the author mentioned was the Tara Brooch. I checked all of my research books looking for a picture that was good enough to discern which form of wire weaving was used. No luck. I went online. The Tara Brooch is held by the National Museum of Ireland. They show poor quality pictures that focus completely on the elaborate gold work of the brooch. The chain on the brooch looks like a rat’s tail in most of the pictures – just a dark silhouette with almost no detail. I had always thought it was done in the Nahlbinding style of wire weaving, but I have no good proof. The class teacher at Gulf War did not have a handout. We were permitted to use our phones to copy some not-great-photos of pictures of some of these pieces. The big problem is that all of the pictures are reproduced from drawings that were made of the pieces in the 1800’s. Are they accurate, or not? 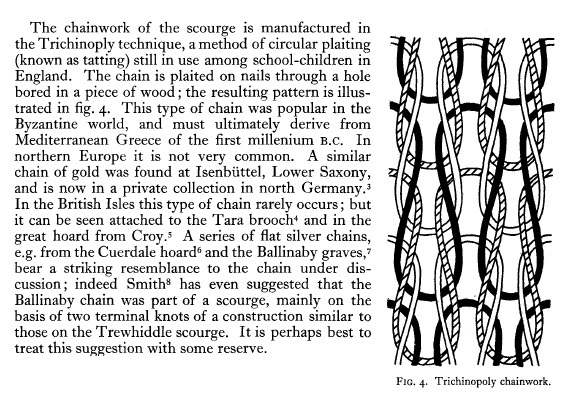 If they are accurate it appears that the chain from Inch Kenneth, Ballinaby, Skaill, Croy, and Garron Point are all made in the “Anglo- Saxon” fashion (knit rather than Nahlbinding). But what if they are not accurate, or are inconsistent in their accuracy? I did try to locate the actual pieces of the hoards. The Cuerdale Hoard went to more than 170 locations including the British Museum, the Ashmolean Museum, and the National Museums in Liverpool. I viewed all 184 of the pictures of the Cuerdale Hoard that were available from the British Museum. It was all hack silver, bar stock and bracelets. A review of the Cuerdale pieces at the Ashmolean revealed about 40 pieces of silver – all hack silver, bar stock and bracelets. The National Museums, Liverpool are in the process of digitizing their artifacts and have nothing useful about the Cuerdale hoard online except a discussion of the over 800 coins from this hoard that they have in their numismatic collection. Dead End! I finally found a picture of the chain from the Great Hoard of Croy online. The description states that it is made in the Trichinopoly technique using a continuous wire. I have to admit, it does look to be knit, but the resolution of the picture is just NOT good enough to be certain. But is any of this significant? I guess we will have to talk about that next time! Wire Weaving – Not as Simple an Issue as it Seems -Part 4 – Wire Weaving and Trichinopoly: Are they the same? So when I took that class at Gulf War, I was immediately excited when I saw the information that the teacher was presenting. Sad to say I actually remembered having run across it a couple of years earlier, while looking for something else. It was one of those things that I planned to “get back to”. I tried to explain to the teacher how important her information was and that she could use fiber terms to help her students to understand the structures that she was discussing. Her response – I don’t do fiber. OK. But a LOT of people do – more than the number of people who do metal. This is why I require my apprentices to have an open mind towards at least understanding the basic technology of crafts other than their own. Back in 1774 a hoard was located in an old tin mine. Known as the Trewhiddle Hoard. It had some very unusual and unique metal items, including what is believed to be the oldest surviving Christian ceremonial scourge. The scourge was made of silver wire. The Reverand Philip Rashleigh managed to acquire most of the find and wrote a report on it in 1788, which was published in the Society of Antiquaries journal, Archaeologia, IX, 187. As was typical of many of the discoveries that occurred during this timeframe, a considerable portion of the original find has disappeared. Fortunately, the scourge has survived and is in the British Museum. The original report by Rashleigh does not shed any light on the structure of the scourge, being a simple listing of the items that were found. The decision to call the technique Trichinopoly is lost somewhere in my archives. I thought that I had discovered the gentle’s name, but I can’t currently locate it. Supposedly the story was that being stationed at some point in Trichinopoly, India, a British Colonial Administrative District, the individual in question recognized the technique as something that he had seen in India, and gave the technique a name. In 1961 D.M Wilson and C.E. Blunt published an article, again in Archaeologia (Jan 1961, Vol. 98) titled, The Trewhiddle Hoard. And they detailed the structure of the scourge wire. I have to admit, this brief excerpt makes my head hurt. Looking at the picture the structure of the scourge is obviously knit. The author’s description of the “circular plaiting” as tatting is incorrect. According to the Merriam-Webster’s Dictionary tatting is: a delicate handmade lace formed usually by looping and knotting with a single cotton thread and a small shuttle. My Mother used to make tatted doilies, I know what it looks like. Interestingly enough, their description of the spool knitting that the children were doing is correct at least as far as the structure of the “plaiting” is concerned. I decided to investigate the individual finds that are mentioned to try to determine if they were being consistent in the use of the word Trichinopoly, or not. Next time: Consistent or Not, and Why is ANY of this Significant? The Treasury Newsletter contains brief informative links to articles and pictures of interest to re-enactors selected by Eirny. It is e-mailed weekly to subscribers. You may manage your preferences by clicking the link supplied with every newsletter. Hoard of coins buried to keep it safe in 1549.